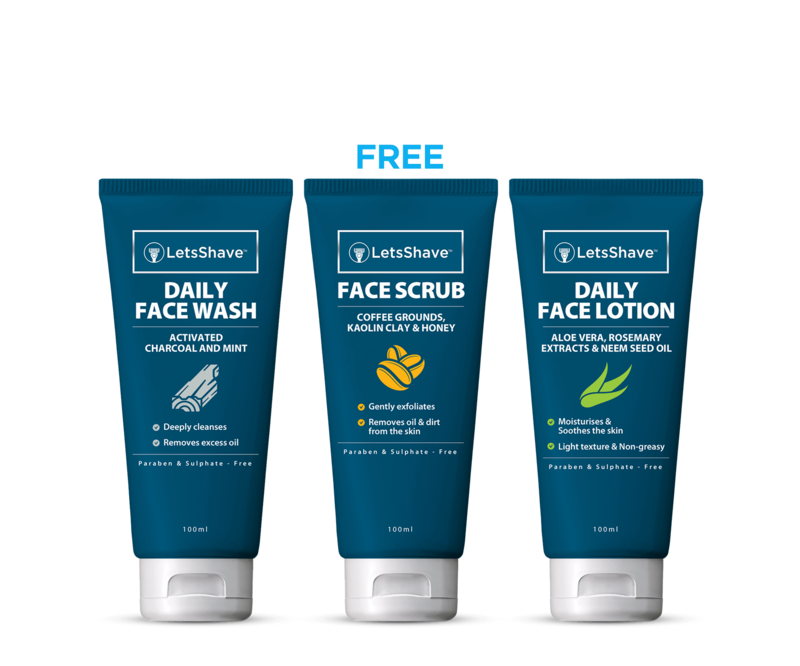 LetsShave face scrub contains quality Coffee grounds, Kaolin clay fuller's earth, and Honey that gives deep yet gentle exfoliation by removing the dead layer of skin cells. It can also be used before shaving to lift hair up for a smooth shave thus preventing ingrown hair. The third product in this combo is LetsShave Face Lotion. It is a light-weight moisturizer that instantly hydrates & protects to leave your skin looking fresh, nourished and vibrant. It is formulated with Aloe vera extract, Rosemary extract, and Neem seed oil helps soothe, moisturize & rejuvenate even dry, sensitive skin. The lotion gets quickly absorbed into the skin to make you stay hydrated for a long. Non-greasy. Non-sticky. Non-comedogenic. Most skin care brands guide you for cleansing first, exfoliating second, then moisturizing and applying sunscreen during day time. But celebrity Cosmetologist Dr Sonia Oberoi, guide us with step-reversing Skincare system where you must exfoliate at the beginning to better results. If you just use a cleanser first, the majority of that debris, the top layer of the skin is not removed. Hence we recommend using a face scrub first to blast the skin's surface., Step 1:- Wet your skin with lukewarm water and squeeze a small amount of scrub on to your fingertips. Then, evenly and gently rub our scrub onto your face and neck in circular motions for about 1 to 2 minutes. Rinse off. The face scrub has a creamy texture formulated to prime the skin for the cleansing step. It has coffee ground and kaolin's clay that not only exfoliate the dead skin cells but also pull the dirt, excess oil & sebum build-up. Step 2:- After scrubbing, the skin's top layer is ready to deeply cleanse. Using Face wash as a second step truly cleanses your skin from deep within without leaving any residue from scrub or environmental pollution. It doesn't leave any possibility of clogged pores. Step 3:- After washing your face, your skin's topmost layer get ready to be nourished by deeply absorbing all the good ingredients of Daily Face Lotion such as Aloe vera + Rosemary Extracts + Organic Neem Seed Oil. Give it a try. You would see better results.